Narsingdi, Oct 17 : Two female suspected militants surrendered on the second day of ‘Gordian Knot’ operation at another ‘militant den’ at Gangpar in Madhabdi municipality here on Wednesday. Khadiza Akther Meghla and Mou surrendered in response to the request of law enforcers around 2:35 pm. After their surrender, the operation that began on Monday night was declared over. UNB’s Narsingdi Correspondent from the spot said the two women were taken out of the building in an ambulance of Narsingdi fire service and now they are being moved to Dhaka. Earlier, the law enforcers had asked them several times over loudspeakers to surrender. Briefing reporters around 3pm after the surrender of the two female militants, CTTC chief Monirul Islam revealed the identities of the two militants who were killed during Monday’s operation at Bhogiratpur in Sadar upazila. The two deceased militants were Abu Abdullah Al Bangali and his wife Aklima Akhter Moni, said the CTTC chief. 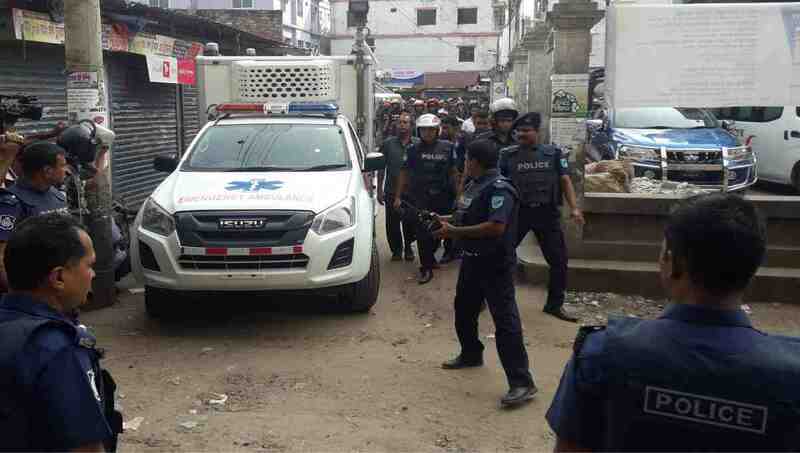 Members of Rapid Action Battalion (Rab) in a drive arrested four female militants, including Meghla, Mou and Moni, from the capital’s Mirpur area in August, 2016 in connection with a case filed over militant attack at Holey Artisan, said Monirul. After their release from jail recently, they tried to continue their militant activities from hideouts in different areas. Later, they took shelter separately in two areas of Narsingdi, he added. A case will be filed with Madhabdi Police Station in this connection. CTTC members in association with the local police kept the 7-storied building owned by Afzal Haji cordoned off since Monday night. Earlier, members of CTTC unit and Special Weapons and Tactics (SWAT) conducted an operation at a ‘militant den’ in a five-story building at Bhogiratpur on Tuesday afternoon and recovered the bodies of two suspected militants. Deputy Inspector General (DIG) of Dhaka Range Chowdhury Abdullah Al-Mamun was also present.